Pitch-accented languages may have a more complex accentual system than stress-accented languages, in that in some cases they have more than a binary distinction, but are less complex than fully tonal languages such as Chinese or Yoruba, which assign a separate tone to each syllable. For example, in Japanese short nouns (1-4 moras) may have a drop in pitch after any one mora, but more frequently on none at all, so that in disyllabic words followed by a particle there are three-way minimal contrasts such as kaꜜki wa "oyster" vs. kakiꜜ wa "fence" vs. kaki wa "persimmon". Ancient Greek words had high pitch on one of the last four vocalic morae in a word, and given that a vowel may have one or two morae, a syllable can be accented in one of four ways (high pitch, rising pitch, falling pitch, none). In addition, the mapping between phonemic and phonetic tone may be more involved than the simple one-to-one mapping between stress and dynamic intensity in stress-accented languages. Proto-Indo-European accent is usually reconstructed as a free[nb 1] pitch-accent system,[nb 2] preserved in Ancient Greek, Vedic, and Proto-Balto-Slavic. The Greek and Indic systems were lost: Modern Greek has a pitch produced stress accent, and it was lost entirely from Indic by the time of the Prākrits. Balto-Slavic retained Proto-Indo-European pitch accent, reworking it into the opposition of "acute" (rising) and "circumflex" (falling) tone, and which, following a period of extensive accentual innovations, yielded a pitch-accent based system that has been retained in modern-day Lithuanian and West South Slavic languages (in some dialects). Some other modern Indo-European languages have pitch accent systems, like Swedish and Norwegian, deriving from a stress-based system they inherited from Old Norse,[nb 3] and Punjabi, which developed tone distinctions that maintained lexical distinctions as consonants were conflated. The combination *[ábá] does not occur. With longer words, the distinction becomes more apparent: eight distinct tonal trisyllables [ábábá, ábábà, ábàbá, àbábá, ábàbà, àbábà, àbàbá, àbàbà], vs. four distinct pitch-accented trisyllables [ábaba, abába, ababá, ababa]. Secondly, there may be more than one pitch possible for the tonic syllable. For example, for some languages the pitch may be either high or low. That is, if the accent is on the first syllable, it may be either [ába] or [àba] (or [ábaba] and [àbaba]). In stress-accent systems, on the other hand, there is no variation between different stressed syllables. (If there is secondary stress in a stress-accent language, as is sometimes claimed for English, there must always be a primary stress as well; such languages do not contrast [ˈaba] with primary stress only from [ˌaba] with secondary stress only.) In addition, whereas non-compound words may have more than one stress-accented syllable, as in English, multiple pitch-accent words are not normally found. In a wider and less common sense of the term, "pitch accent" is sometimes also used to describe intonation, such as methods of conveying surprise, changing a statement into a question, or expressing information flow (topic–focus, contrasting), using variations in pitch. A great number of languages use pitch in this way, including English as well as all other major European languages. They are often called intonation languages. The term "pitch accent" is also used in Native American linguistics to refer to minimal tonal systems such as are found in Iroquoian and Athabaskan languages, for example. In Ancient Greek, one of the final two or three syllables of a word carries an accent. Each syllable may contain one or two vocalic morae, but only one can be accented; accented morae are pronounced at a higher pitch. In polytonic orthography, accented vowels are marked with the acute accent. Long vowels and diphthongs are thought to be bimoraic, and, where the accent falls on the first mora, they are marked with the circumflex. Long vowels and diphthongs that are accented on the first mora have a high–low (falling) pitch contour, and, if accented on the second mora, they have a low–high (rising) pitch contour. Many speakers of Hong Kong English tend to assign one of the six tones (or nine, if entering tones are included) of the Cantonese language to different words, giving it a Cantonese style. E.g. most Hong Kongers would pronounce "there" and "their" differently, giving a higher pitch to "there" [ˈtɛ́] (tone 1 in Cantonese) and a lower pitch to "their" [ˈtɛ̀] (tone 6 in Cantonese). In Broad South African English, /h/ is often deleted, e.g. in word-initial stressed syllables (as in house), but at least as often it just sounds as if it were deleted, when it is actually retained. The vowel that follows the [ɦ] allophone in the word-initial syllable often carries a low or low rising tone, which in rapid speech can be the only trace of the deleted /h/. This creates potentially minimal tonal pairs like oh (neutral [ʌʊ˧] or high falling [ʌʊ˦˥˩]) vs. hoe (low [ʌʊ˨] or low rising [ʌʊ˩˨]). A distinctive feature of Welsh English is the rising pitch on the last syllable. Baltic tones are often classified as either "acute" or "circumflex." These labels indicate rather a diachronic correspondence not a phonetic one. For example, Acute is falling in Lithuanian but a high level tone in Latvian and presumably rising in Old Prussian and Classical Greek. Circumflex is rising in Lithuanian but falling in Latvian, Prussian and Classical Greek. In the tree diagram on the right, as adopted from Poljakov, names for (original) Baltic tones have been equated with those of modern Standard Lithuanian and the falling tone in Latvian is depicted as derived from a Baltic rising tone. According to some it was Lithuanian that "switched places" the Baltic tones. This might explain why most languages call a rising tone "acute" while in Baltic terminology a falling tone is "acute." Some controversy surrounds Poljakov's model, it has been harshly criticized by Frederik Kortlandt. Kortlandt contends that broken tone in Latvian and Žemaitian is a reflex of a now disappeared glottal stop in Balto-Slavic not preserved in Aukštaitian (Standard Lithuanian) or Slavic languages and not a recent development of acute. Outside of Central Vidzeme (Standard Latvian) the three-way system has been simplified, in Eastern Latvian (Latgale) only broken and falling pitches are distinguished. Speakers of Rīga Latvian and other more westward varieties differentiate only between level and broken pitches with the falling pitch being merged with the broken one. Thus the Standard Latvian "minimal triplet" or "minimal set" of [zāːle] (hall), [zâːle] (grass) and [zàːles] (medicine) in Rīga Latvian would be reduced to "hall" (level pitch) and "grass" (broken pitch) and "medicine" would be pronounced with a broken pitch just like "grass." In late 19th century Danish linguist Vilhelm Thomsen in the speech of a Livonian sailor identified a characteristic that to him seemed very similar to the Danish stød, this feature was later the subject of research by several Finno-Ugricists. Although the (Indo-European) Latvian and (Uralic) Livonian are phylogenetically unrelated (being from different language families) both have influenced each other heavily in terms of phonology. Whether Livonian acquired this feature from Latvian or vice versa is debated, however, owing to the fact that Livonian is the only Finno-Ugric language to have this feature, the majority of researchers believe it has been a product of Latvian influence on Livonian and not the other way around. It is possible that "Livonian stød" would be classified as a pitch accent only by Latvian classification just like the identical Latvian lauztā intonācija, otherwise it would be considered a pitch register, glottalization or similar categories as discussed above. The Livonian-Estonian-Latvian dictionary at www.murre.ut.ee uses an apostrophe after a vowel to indicate broken pitch, for example, Mi’nnõn u’m vajāg instead of just Minnõn um vajāg. Most dialects differentiate between two kinds of accents. Often referred to as acute and grave accent, they may also be referred to as accent 1 and accent 2 or tone 1 and tone 2. Hundreds of two-syllable word pairs are differentiated only by their use of either grave or acute accent. A list of such Swedish words is collected at Swedish WorldHeritage: Lista över svenska ordaccentsskilda minimala par. Accent 1 is, generally speaking, used for words whose second syllable is the definite article, and for words that in Old Norse were monosyllabic. These are described as tonal word accents by Scandinavian linguists, because there is a set number of tone patterns for polysyllabic words (in this case, two) that is independent of the number of syllables in the word; in more prototypical pitch-accent languages, the number of possible tone patterns is not set but increases in proportion to the number of syllables. For example, in many East Norwegian dialects, the word "bønder" (farmers) is pronounced using tone 1, while "bønner" (beans or prayers) uses tone 2. Though the difference in spelling occasionally allows the words to be distinguished in written language, in most cases the minimal pairs are written alike. A Swedish example would be the word "tomten," which means "Santa Claus" (or "the house gnome") when pronounced using tone 2, and means "the plot of land," "the yard," or "the garden" when pronounced using tone 1. Thus, the sentence "Är det tomten på tomten?" ("Is that Santa Claus out in the yard?") uses both pronunciations right next to each other. Another example in Swedish is the word "anden", which means "the duck" when using tone 1 and "the spirit" when using tone 2. "Den heliga anden" could, in writing, be construed as either "the Holy Spirit" or "the holy duck", whereas in speech the pitch accent would convey the intended meaning. Although most dialects make this distinction, the actual realizations vary and are generally difficult for non-natives to distinguish. In some dialects of Swedish, including those spoken in Finland, this distinction is absent. There are significant variations in the realization of pitch accent between dialects. Thus, in most of western and northern Norway (the so-called high-pitch dialects) accent 1 is falling, while accent 2 is rising in the first syllable and falling in the second syllable or somewhere around the syllable boundary. The word accents give Norwegian and Swedish a "singing" quality which makes it fairly easy to distinguish them from other languages. In Danish (except for some southern dialects), the pitch accent of Swedish and Norwegian corresponds to the glottalization phenomenon known as Stød. 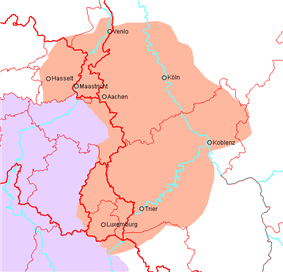 A pitch accent is found in the following Franconian languages, or language groups: Luxembourgish, Limburgish, Ripuarian and Moselle Franconian. They are sometimes collectively referred to as West Central German tonal languages. Despite significant differences between individual languages within these groups, generally most often there is a contrast between unaccented syllables and accented ones having either of two tonal accents, or sometimes none. The tonal accents are referred to under a variety of names and denominations. Tonal accent 1, called sleeptoon in Dutch or Schärfung in German, has mostly a steep rise of pitch followed by a sharp drop of both pitch and intensity and a return to their previous levels. Tonal accent 2, named stoottoon in Dutch, is having a linear slightly falling contour keeping intensity level. Welsh has a simple pitch accent but this does not affect meaning because it is always on the same syllable. It does however make it easier to differentiate words in rapid speech. The stress accent is normally on the last or penultimate syllable in Welsh, but the pitch accent is always placed on the last syllable of a word as a high pitch. Neoštokavian idiom used for the basis of standard Bosnian, Croatian and Serbian distinguishes four types of pitch accents: short falling ⟨◌̏⟩, short rising ⟨◌̀⟩, long falling ⟨◌̑⟩ and long rising ⟨◌́⟩. The accent is said to be relatively free as it can be manifested in any syllable but the last one. The long accents are realized by pitch change within the long vowel; the short ones are realized by the pitch difference from the subsequent syllable. Accent alternations are very frequent in inflectional paradigms, both by quality and placement in the word (the so-called "mobile paradigms", which were present in the PIE itself but in Proto-Balto-Slavic have become much more widespread). Different inflected forms of the same lexeme can exhibit all four accents: lònac 'pot' (nominative sg. ), lónca (genitive sg. ), lȏnci (nominative pl. ), lȍnācā (genitive pl.). Restrictions on the distribution of the accent depend, beside the position of the syllable, also on its quality, as not every kind of accent can be manifested in every syllable. Rising tone generally occurs in every syllable of a word except the ultimate and never in monosyllabics (vòda 'water', lúka 'harbour'; lìvada 'meadow', lúpānje 'slam'; siròta 'female orphan', počétak 'beginning'; crvotòčina 'wormhole', oslobođénje 'liberation'). Thus, monosyllabics generally have falling tone, whilst polysyllabics generally have falling or rising tone on the first syllable, and rising in all the other syllables but the last one. The tonal opposition rising ~ falling is hence generally only possible in the first accented syllable of polysyllabic words, while the opposition by lengths, long ~ short, is possible even in the non-accented syllable as well as in the post-accented syllable (but not in the pre-accented position). Proclitics (clitics which latch on to a following word), on the other hand, can "steal" a falling tone (but not a rising tone) from the following mono- or disyllabic word (as seen in the examples /vîdiːm/→/ně‿vidiːm/, /ʒěliːm/→/ne‿ʒěliːm/). This stolen accent is always short, and may end up being either falling or rising on the proclitic. This phenomenon, although obligatory in Neoštokavian idiom and so in all three standard languages, is often lost in spoken idioms due to the influence of other dialects (e.g. in Zagreb, the influence of kajkavian dialect). In Slovenian, there are two concurrent standard accentual systems — the older, tonal, with three "pitch accents", and younger, dynamic (i.e. stress-based), with louder and longer syllables. The stress-based system was introduced because two thirds of Slovenia does not have tonal accent anymore. In practice, however, even the stress-based accentual system is just an abstract ideal and speakers generally retain their own organic idiom even when trying to speak standard Slovenian (e.g. the speakers of urban idioms at the west of Slovenia which don't have distinctive lengths don't introduce that kind of quantitative opposition when speaking the standard language). Older accentual system, as it was said, is tonal by quality and free (jágoda 'strawberry', malína 'raspberry', gospodár 'master, lord'). There are three kinds of accents: short falling ⟨◌̀⟩, long falling ⟨◌̑⟩ and long rising ⟨◌́⟩. Non-final syllables always have long accents (◌̑ or ◌́), e.g. rakîta 'crustacea', tetíva 'sinew'. Short falling accent can come only in the ultimate (or the only, as is the case in monosyllabics) syllable, e.g. bràt 'brother'. It is only there that three-way opposition among accents is present: deskà 'board' : blagọ̑ 'goods, ware' : gospá 'lady'. Accent can be mobile throughout the inflectional paradigm: dȃr — darȗ, góra — gorẹ́ — goràm, bràt — bráta — o brȃtu, kráva — krȃv, vóda — vodọ̑ — na vọ̑do). The distinction is made between open -e- and -o- (either long or short) and closed -ẹ- and -ọ- (always long). 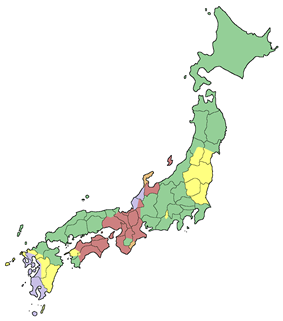 Map of Japanese pitch-accent types. Red: Tone plus variable downstep. Green: Variable downstep in accented words. Lavender: Fixed downstep in accented words. Yellow: No distinction. Japanese is often described as having pitch accent; this differs significantly between dialects. In standard (Tokyo-dialect) Japanese, this "accent" may be characterized as a downstep rather than as pitch accent. The pitch of a word rises until it reaches a downstep, then drops abruptly. In a two-syllable word, this results in a contrast between high–low and low–high; accentless words are also low–high, but the pitch of following enclitics differentiates them. The Shanghai dialect of Wu Chinese is marginally tonal, with characteristics of pitch accent. ^ The term free here refers to the position of the accent—its position was unpredictable by phonological rules, i.e. it could stand on any syllable of a word, regardless of its structure. This is opposed to fixed or bounded accent whose position is determined by factors such as the syllable quantity and/or position, e.g. in Latin where it's on the penultimate syllable if it's "heavy", antepenultimate otherwise. ^ Fortson IV (2004:62) "From the available comparative evidence, it is standardly agreed that Proto-Indo-European was a pitch-accent language. There are numerous indications that the accented syllable was higher in pitch than the surrounding syllables. Among the Indo-European daughters, a pitch-accent system is found in Vedic Sanskrit, Ancient Greek, the Baltic languages and some South Slavic languages, although none of these preserves the original system intact." ^ Proto-Germanic had fixed accent on the first syllable of a phonetic word, a state of affairs preserved in oldest attested Germanic languages like Gothic, Old English and Old Norse. Free Proto-Indo-European accent was lost in Germanic rather late, after the operation of Verner's law. ^ The term is often defined as tone on only one syllable or mora. However, in the Korean pitch-accent system, tone is allowed on two adjacent syllables in initial position, and this contrasts with tone on just one of these syllables. ^ For example the accentual systems of the spoken idioms of the Croatian capital Zagreb and the city of Rijeka are stress-based and do not make use of distinctive vowel lengths or pitch accent. ^ Demers, Escalante, Jelinik. "Prominence in Yaqui Words". International Journal of American Linguistics. ^ Matthew Y. Chen, Tone Sandhi: Patterns across Chinese Dialects, CUP, 2000, p. 223. ^ Oleg Poljakov (1997). "Über Herkunft und Entwicklung der Silbenakzente im Lettischen". Baltistica: 64. ^ Dahl, Östen (2001). The Circum-Baltic Languages: Grammar and typology. John Benjamins Publishing. p. 736. ^ a b Frederik Kortlandt, "The rise and fall of glottalization in Baltic and Slavic"
^ a b c Kortmann, Bernd (2011). The Languages and Linguistics of Europe. Walter de Gruyter. p. 6. ^ a b Kiparsky, Paul. "Livonian stød" (PDF). Stanford University. Retrieved 6 December 2013. (..)what is the historical relationship between the Livonian stød and the identical or at least very similar “Stosston” intonation of the coterritorial Latvian language? Almost certainly one of them got it from the other. The languages have influenced each other in many ways, in both directions. But which way did the influence go in this case? Scholarly opinion on this question is divided. Thomson (1890: 59) and Kettunen (1925: 4) thought that Livonian had borrowed the stød from Latvian, whereas Posti (1942: 325) thought that Latvian got it from Livonian. My conclusion that the Livonian stød is a tonal feature is more consonant with the former view. Livonian is the only Finno-Ugric language known to have a tonal or pitch accent, while it is a feature of several branches of Indo-European, including Balto-Slavic in particular. On the hypothesis that Livonian got its stød under the influence of Latvian, we account for the Livonian stød by language contact, and for the Latvian stød as a Baltic inheritance. ^ Rajka Smiljanic (31 October 2013). Lexical, Pragmatic, and Positional Effects on Prosody in Two Dialects of Croatian and Serbian: An Acoustic Study. Routledge. pp. 22–.